While we strive for accuracy, alas, from time-to-time, our efforts yield imperfect results. Some inaccuracies in our products are there by design, as necessary compromises made for technical or aesthetic reasons, but the errors listed on this page were unintentional. If you should find an error in our products or documentation that is not listed here, then please let us know! The genetic material of a virus is encapsulated by a structure known as a capsid. 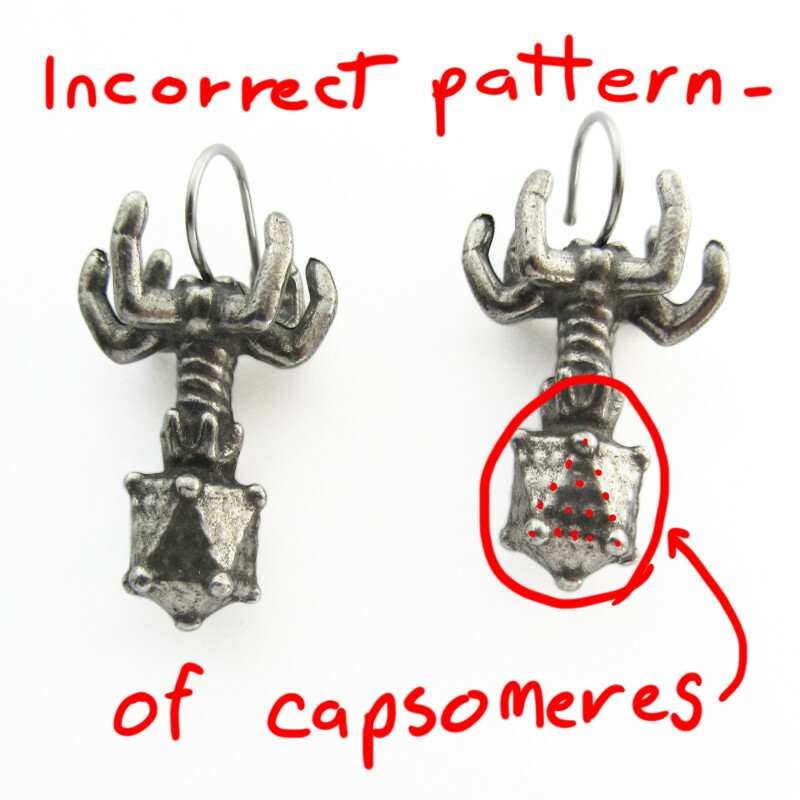 This capsid, which is often icosohedral in shape is built from sub-units known as capsomeres. The arrangement of an animal's digits is known as "dactyly". The talons of most birds are "syndactyl", meaning that three toes face forward, and one backward, and this is how we modeled the toes of this owl keychain... 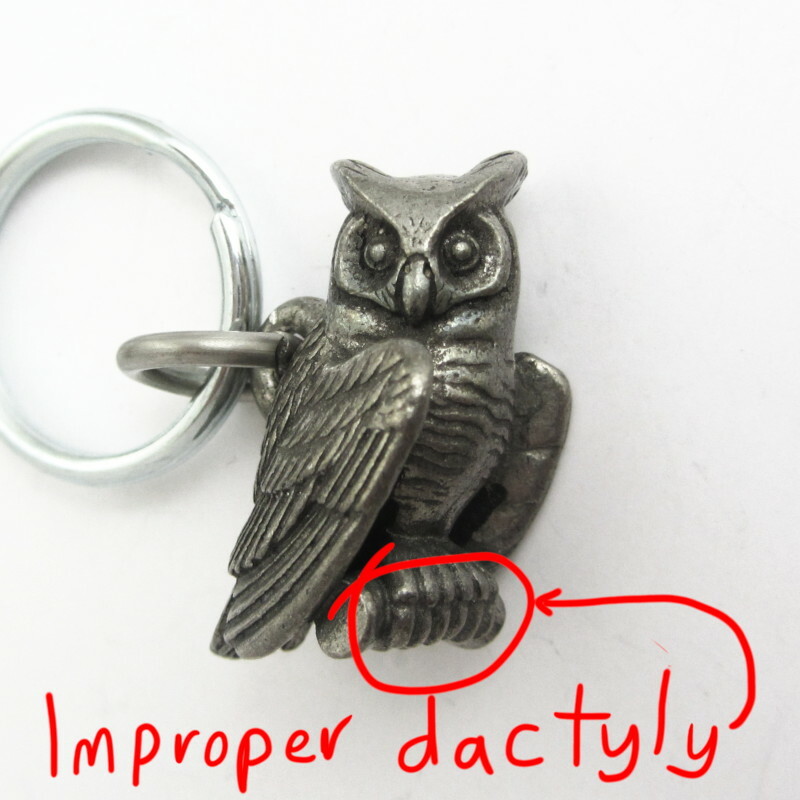 Unfortunately, the talons of the great horned owl, which this keychain depicts, are in fact "zygodactyl", meaning that two toes face forward, and two backward. 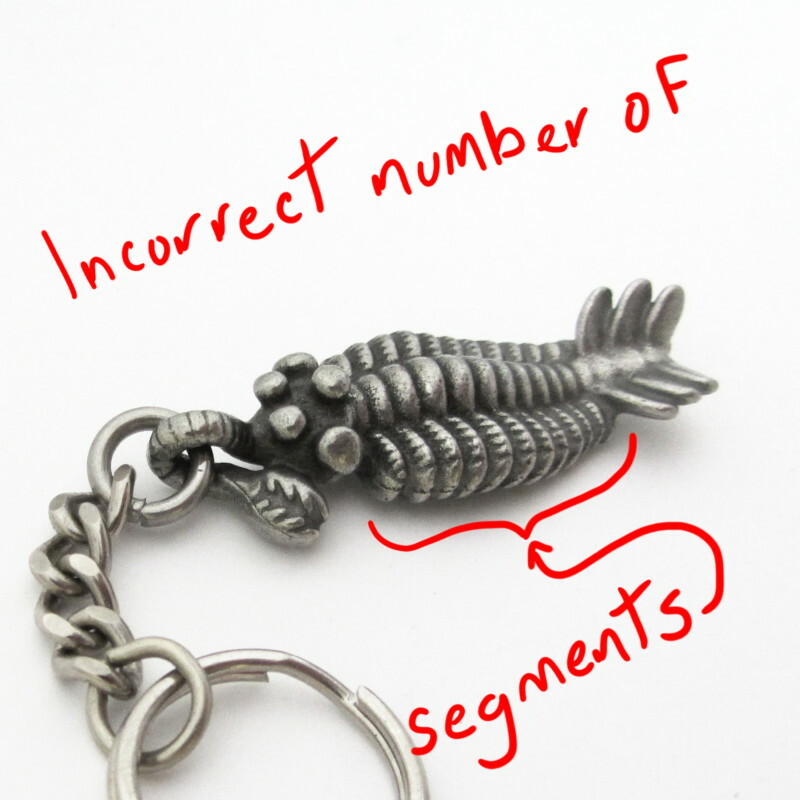 The body of opabinia should have 15 body segments, but alas, our opabinia keychain and pendant have only 12. A salamander ought to have 4 toes on each of its forefeet. 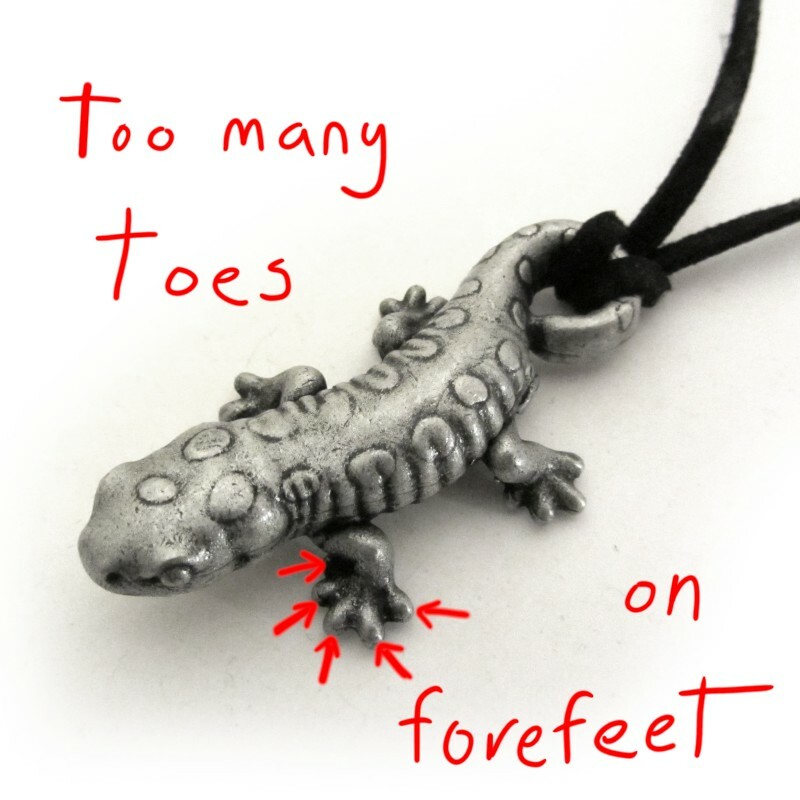 A mnemonic device which would have helped us when creating our salamander, which has 5 toes each on all of its feet. A hotspot volcanic chain is created by the movement of one of Earth's tectonic plates over a "hotspot" which is thought to originate in the underlying mantle. 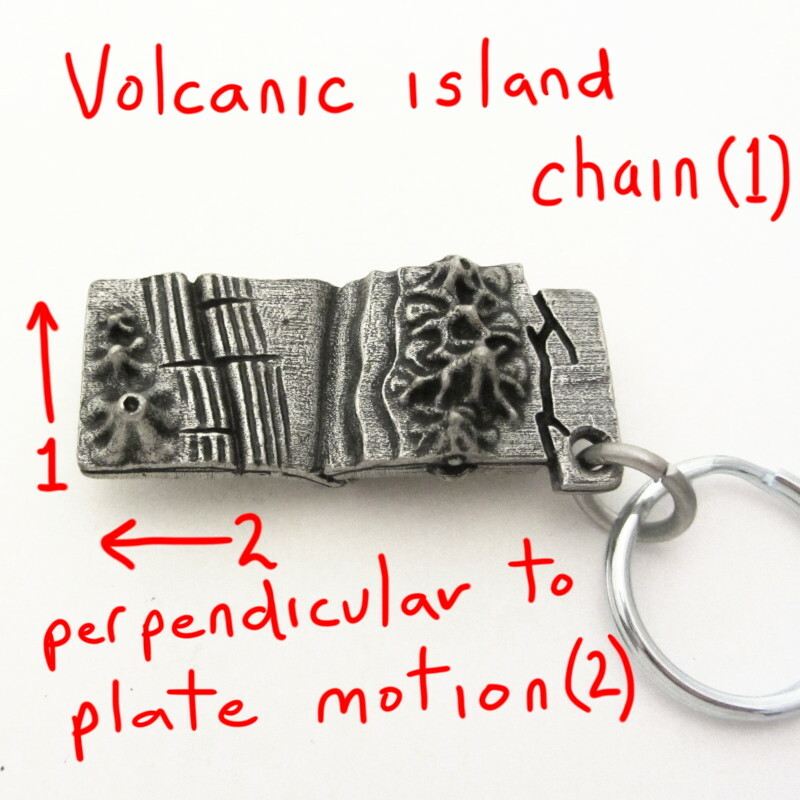 Because of how they are formed, hotspot island chains always run parallel to the direction of motion of the plate... unfortunately, the island chain that is depicted in our plate tectonics keychain is oriented perpendicular to the direction of plate motion. 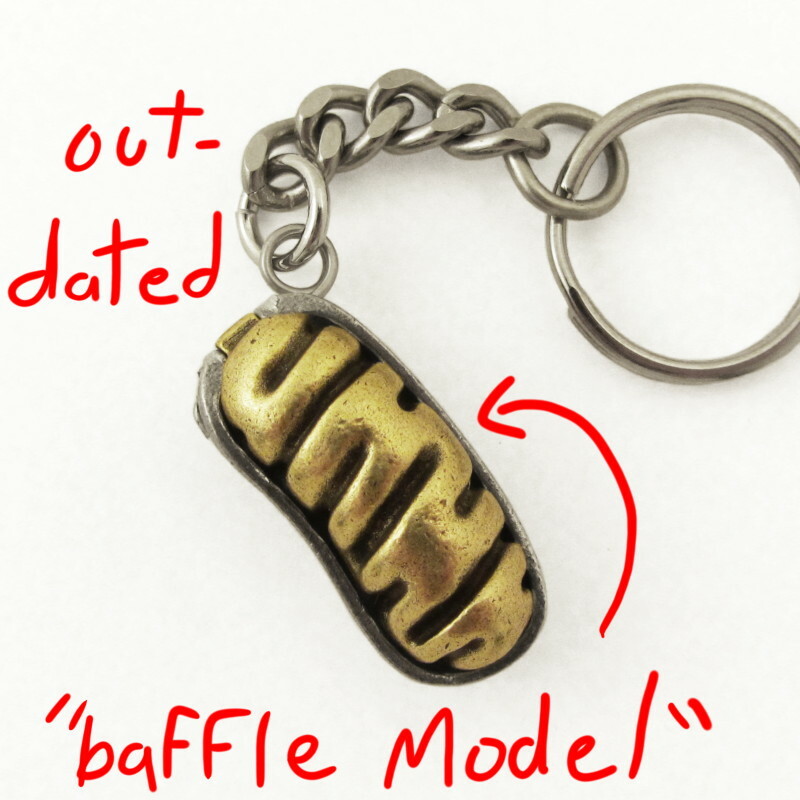 For many years it has been accepted that the inner membrane of the mitochondrion was convoluted in the manner depicted in our keychain. This "baffle model" of the mitochondrial membrane has recently begun to be supplanted by a new understanding known as the "crista-junction model". While the baffle model is still the way most diagrams and sciart depict the mitochondrion, it is no longer thought to be accurate!